Paul Johnson, who turned Georgia Southern and then Navy into respectable football teams, has been hired to restore Georgia Tech to prominence. Navy coach Paul Johnson, who turned one of the country’s worst teams into an annual bowl participant, has agreed to become Georgia Tech’s next football coach, Navy athletic director Chet Gladchuk confirmed Friday morning. Johnson, who had a 45-39 record in six seasons at Navy, replaces Chan Gailey, who was fired as Georgia Tech’s coach Nov. 26. After turning Navy into a regular bowl contender, Paul Johnson is leaving for ACC country. Johnson informed the team at an 11:45 a.m. meeting at the Navy’s Ricketts Hall, where the football offices are located, said Scott Strasemeier, Navy’s associate athletic director for sports information. Georgia Tech has scheduled a 5:30 p.m. ET news conference to announce the hiring of Johnson. 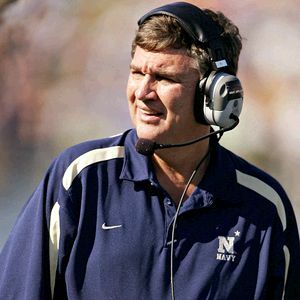 Johnson, who is perhaps best known for his potent triple-option spread offense, led the Midshipmen to unprecedented success during his tenure at the academy. Under his watch, Navy was 11-1 against Army and Air Force and won the Commander-In-Chief’s Trophy five consecutive seasons. Navy went 8-4 this season and beat Notre Dame 46-44 in triple overtime, ending an NCAA-record 43-game losing streak to the Fighting Irish. Navy plays Utah in the Dec. 20 San Diego County Credit Union Poinsettia Bowl. Gladchuk said Johnson will not coach in the bowl game. Johnson previously worked at Division I-AA Georgia Southern, where he led the Eagles to a 62-10 record and two consecutive I-AA national championships. Johnson was also considered a candidate for vacancies at Duke and SMU but informed both of those schools Friday morning that he wasn’t taking either job. Georgia Tech also considered former Washington coach Rick Neuheisel, former Auburn coach Terry Bowden, Georgia Southern coach Chris Hatcher and Florida defensive coordinator Charlie Strong. Connecticut coach Randy Edsall also interviewed for the job but quickly removed himself from consideration. A great hire by Tech. I’m surprised Johnson lasted as long as he did at Navy, honestly. Indeed, he was reportedly on Alabama’s short list last year before they ultimately lured Nick Saban away from the Miami Dolphins.